From the moment the first two Soothe Our Souls (SOS) International Women's Retreat attendees were greeted by SOS Founder and CEO of VIP Publishing, Inc. (the host organization of the retreat), Carole 'Ife' Keene, and her husband, William 'Damani' Keene, at Tocumen International Airport, excitement permeated the air - and still lingers. U.S. SOS Retreat Executive Coordinator, Brenda K. Brown, and Committee Member, Vera M. Carey, both from New Jersey - Glassboro and Camden, respectively ­ arrived a week early to help finalize last minute plans for the retreat. Ife and Damani, who have been full-time residents of Panama for two years, wanted to share with others the beautiful country they find enchanting and now call home. They overwhelmingly achieved their goal - even beyond their own high expectations. Over 100 attendees, predominately African-American women, some accompanied by their sweethearts (husbands and boyfriends), from California, Georgia, Illinois, Maryland, New Jersey, New York, Panama, Pennsylvania, South Carolina, Virginia, and Washington, DC, enjoyed a week long substance- and spiritually-packed agenda, including dynamic speakers, workshop presenters, special presentations, authors' book signings, excursions, tours, exhibits, massages and facials and salsa dance lessons. In addition there was unforgettable entertainment including U.S. singers Vera M. Carey and Gail Randolph, and renown Panamanian musician and band leader Edmundo Archibold, and the Folkloric Dancers from the Instituto Episcopal San Cristobal. The inaugural Soothe Our Souls International Women's Retreat was held at the Country Inn and Suites Resort Hotel, in Amador, Panama from November 5th ­ November 12th. The retreat could not have been held in a more perfect location ­ away from the heart of the city, but not too far from the action ­ if that's what participants were looking for. 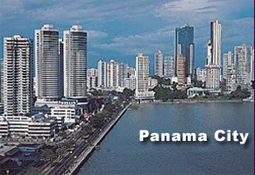 Each day all guests were greeted by a breathtaking canal view of Panama from their balconies. The concept of SOS and the retreat are an outgrowth of a book Ife wrote and published, Cancer of the Spirit. The mission of SOS is to assist women with achieving increased self-empowerment and to offer a vehicle that will potentially help enhance their self-esteem. The book weaves touching stories about the lives of ten women into a colorful quilt of all-too-human struggles and exhilarating triumphs. All stories are fictional, with one exception. That story is the author's own. Many of the issues that are revealed in the book were topics covered in the retreat workshops, including Health and Wellness, Personal and Professional Enhancement, Spiritual Rejuvenation, Relationship Connections and Reconnections, and Goal Setting. Secondly, the retreat provided basic information on Panama's outstanding Pensionado program and opportunities for retirement, purchasing real estate and the advantages of off-shore investing. Real estate tours in the capital, to mountain and coastal developments, and excursions to the Canal, Gamboa, Isla Grande, Playa Blanca, Panama City, and El Valle were offered. The underlying theme of the retreat was "Relax, Refresh and Rejuvenate." At the SOS All Women's Luncheon, celebrated Panamanian physician, author, poet and playwright, Dr. Rosa Maria Britton, "rocked the attendees' world" with a provocative speech on Health and Fashion. The audience was kept on the edge of their seats during Dr. Britton's fascinating presentation. The retreat culminated with a sell-out closing dinner celebration at which the perfect keynote speaker, Monique Greenwood, the former Editor-in-Chief of Essence Magazine (one of the U.S.'s leading women's magazines), and entrepreneur extraordinaire, spoke. Monique is the President and CEO of Akwaaba Enterprises (www.akwaaba.com), which owns and operates four acclaimed luxury bed-and-breakfast inns in the U.S. ­ Brooklyn, NY, Cape May, NJ, Washington, DC and New Orleans, LA. Monique provided an excellent snapshot of the many outstanding workshops she attended during the retreat and gave an exceptional presentation of many of the topics discussed in her latest "must read" book, Having What Matters, the Black Woman's Guide to Creating the Life You Really Want. Her presentation was perfectly compatible with SOS's mission. Half of the funds from a 50/50 raffle available during the retreat were donated by VIP Publishing, Inc. to the Afro-Antillean Museum of Panama. Delia Brown, the recipient of the other half of the funds and President of the South Jersey Links, a Bronze Sponsor of the retreat, donated her share of the winnings to the museum as well. Corporate sponsors of the SOS International Women's Retreat included: PanamaMLS.com, Altos del Maria, Panama Off-Shore Services International (POSI), Doce Cerros Coastal Development, Pencas and Mi Ranchito Restaurantes, Servicios Denise/Denise Enterprises, Mary's Cafe (of Sora), La Estancia del Encanto B&B (in Altos del Maria), Financial Pacific, the South Jersey Links (USA), and Quality Solutions, Inc. (USA). A special thank you to Senor Ken Jones and the staff at Panama's El Visitante for effectively promoting the SOS retreat. Melva Lowe de Goodin was the SOS Retreat Panama Executive Coordinator and Dr. Kweli Keene Carson, the SOS Retreat Registration Coordinator and Executive Vice President of VIP Publishing, Inc. I have been lucky enough to attend many conferences over the last 35 years. These conferences have been for both personal and professional growth. I must say, without hesitation, that the "Soothe Our Souls Women's Retreat" was as well organized as any conference I have ever attended. You and your committees thought of every detail. * the opportunity to bond with "old friends" and meet "new friends"
I could probably go on and on, but will stop by asking that you please register me for the next retreat. Congratulations on an outstanding conference. The 3 day retreat and the rest of the week was awesome! I loved every moment that I was there. The seminars were so professional, I give everyone who instructed an A+, A+, A+. You two are a blessing in my life and I am so glad that I came to know you the way that I do. To God, I give the glory for putting you in my life! The Hotel was very comfortable and the people who worked there were magnificent. The breakfast every morning was much more than continental. The restaurant that I liked the best was, Pencas. It was the Bomb and the prices were excellent! I could go on and on and I will by telling everyone here at home just how breathtaking of an experience this trip was for me. Speaking of breathtaking, I would not mind living in a box in the hills of Panama, just to look at the scenic view everyday. That literally took my breath away...Truth be told, if I was by myself, no doubt, I would move to Panama in a heart beat. I love you and may God continue to keep on pouring blessings down upon you two.